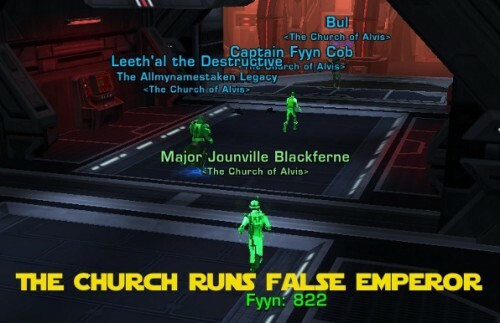 The Church of Alvis is a guild founded in August of 2003 in Star Wars Galaxies. Since then we have spread to other games, but always maintained a connection with each other. With the release of Bioware and LucasArts’s Star Wars: The Old Republic we have reformed on the Juyo Canderous Ordo Jedi Covenant server. Please feel free to browse the site and let us know if you have any questions or are interested in joining. This week the Church of Alvis and our raiding partners at the Snark Side on Jedi Covenant have cleared Story Mode Scum and Villainy. I failed to get a screenshot from the final boss, but here is Friday’s raid standing near Sunder and Ta’chuk of the Warlords fight. Our roster this week included Alorad, Andosha, Biscotti, Boccior, Jounville, Noreek, Premmat, Shattner, Skiggity, and Starel. It was a good week for us and we look forward to upping our game to the Hard Mode 55 ops over the next few weeks I’d imagine. Raiding as always should be fun and in our groups it usually is. Even though we are not on an RP server, the Blackferne clan and Jounville in particular has a life story in my mind. 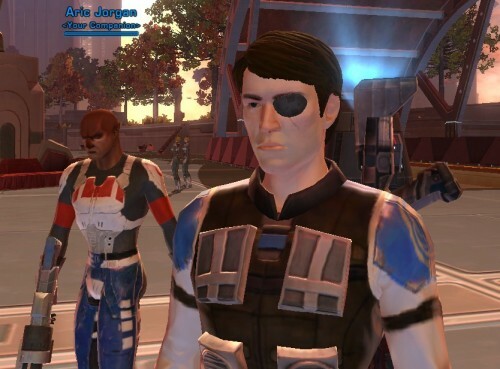 This is a story that has evolved since Star Wars Galaxies, and one of the aspects of that story is that Jounville always should have had an eyepatch. That wasn’t an option in that game, so when SWTOR launched and I could make a character who finally looked more like how he should looked I was pretty happy. Here is Jounville on December 15th 2011. Early access and as you can see by the clown armor Jorgan is in we are pretty low level there. The eyepatch is my thing. I get that technically it is supposed to be a cybernetic eye, but it looks like an eyepatch so for me it IS an eyepatch. Saturday night I helped Boccior, Starel, and Skiggity complete a popular quest chain and we came across a certain Lord Tagriss. What. Period. The. Period. Hell. Period. Question mark. Exclamation mark. This is like two people wearing the same dress to prom. Listen here Lord Tagriss, I don’t know what you think you are doing, but I’ve been all over Spacebook and OurSpace and hell even that social network that only Ortolan’s use, Orkut, and I’ll tell you something, the eyepatch? It is my effing thing. Okay I’m gonna cut you. I hope you still got the receipt because I want you to go back to Sithieland Mall, stroll right into Hoth Topic or whatever and exchange for a straw fedora or that muscle tee with the Jawa Shore logo on it. You can wear those ironically all you want, I don’t care. But the eyepatch? That is mine. On Friday night our Joint Raiding program with The Snark Side ventured for the first time into the seedy underbelly of the new operations. In story mode we got through Thrasher before time expired on our raid. Our raid consisted of Andosha, Biscotti, Boccior, Jounville, Njessi ,Noreek, Shattner, and Skiggity. We picked up on the mechanics very quickly. I will say though the Pirate Stimfiends are kinda crazy. Personally I’m loving the story for the operation and look forward to seeing how it ends. Golden Fury is downed. First Night Second Attempt. Last night the Church of Alvis and our raiding partners The Snark Side on Jedi Covenant went to take a look at Golden Fury in Toborro’s Courtyard for the first time. First attempt we learned, second attempt we killed. Afterwards we worked through Operator IX in TFB SM as we are still gauging our strength after leveling to 55 and regearing. Friday and Saturday our campaigns will continue! Good work by Andosha, Biscotti, Boccior, Jounville, Noreek, Shattner, Skiggity and Starel! 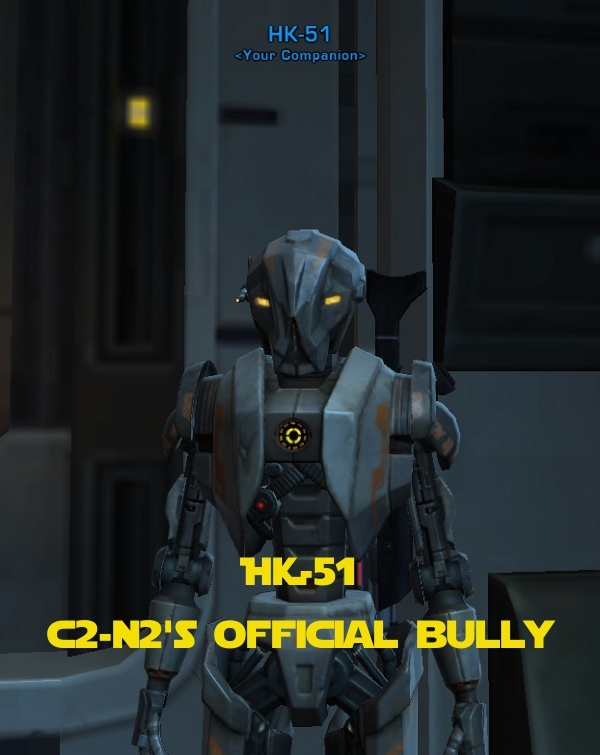 Last week 1.5 hit and with it the exciting HK-51 Assassination droid. The Church of Alvis on Saturday assembled to cooperatively help everyone get significant parts of the quest line done. We officially started with the Outlaws Den portion. 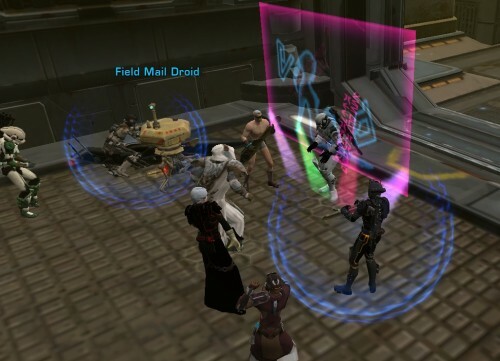 We “RP” walked from the entrance of the Outlaw’s den all the way down to the Jawa selling part of the HK Droid. While it wasn’t the most efficient mode of travel, it did get a remark from Gabrielx on Jedi Covenant who thought we looked cool walking that way. Two Sith were killed and another ran away seeing our posse’s swagger. Gabrielx came by and unfortunately one of our smugglers shot first taking his admiration of Han a bit too far. Apologies to Gabrielx were made as well as a gift to help him on his HK journey. Following that we went to Taris, then Hoth, and then Coruscant fanning out to use our survey team to quickly identify the parts and allowing everyone to get what they needed. We followed up Coruscant with a dip on the Sith side <Pod Six>. Same story in regards to surveying, but with much complaining about Dromund Kaas lacking a unified speeder network. Here I thought despotic authoritarian regimes were supposed to make the speeders run on time. We rounded out Saturday by breaking into groups for the Flashpoint portions. A quick jaunt through False Emperor for my group was a lot of fun. As you can see I ran with up and coming twitter celebrity @FynnCobb as a tank heal team. It was a lot of fun with wisecracking all around. The next day a few of us finished up with a run of Hard Mode Maelstrom Prison. A quick Heroic 2+ on Belsavis later and now C2-N2 has a bully to worry about on my ship. It was a lot of fun and something that gave the Church a great bonding experience outside a raiding context. If you are interested in joining the Church, or participating in our activities please visit our forums and say hi. We love meeting new people and making new friends. Summer vacations were not kind to the Alvis raiding program. 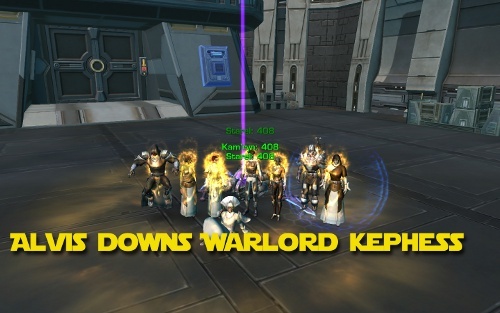 However with fall coming we got back in the groove and downed Warlord Kephess in Explosive Conflict. Tanking was down by Jounville and Shattner. Healing by Starel and Kam’ryn. DPS by Leeth’al, Skiggity, Maizan, and Josselin. A few tweaks between tries and we downed him getting many Alvians their first Kephess kill. Great work! July 16th after settling into our new server Canderous Ordo we set our sights on resuming the push into Explosive Conflict. We pulled together and managed to drop Firebrand and Stormcaller making piles of scrap metal. If you are interested in this quality scrap please contact Furiel. Next up we are going to learn how to defuse landmines. The Church is moving off Juyo and to Canderous Ordo with the Bioware megaserver push. This will be a chaotic time for sure, but we can always be found on our forums. We look forward to getting everyone situated and secure, and bringing our message of drunken vengeance to a whole new server. 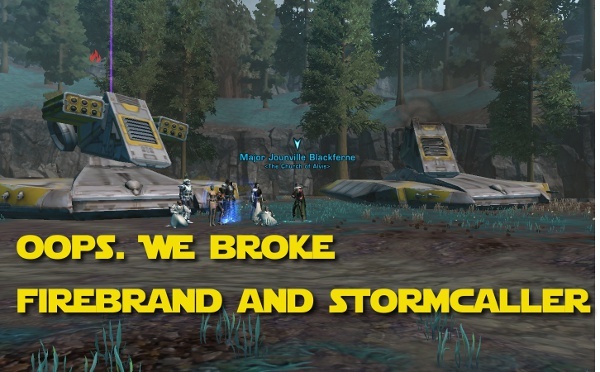 Yesterday the SWTOR community was upset with the layoffs of various Devs. I’ve been thinking a lot about those who were let go, and trying to make sense of it in terms of them as people, them as creators of the game we play, and the future of SWTOR as a whole. 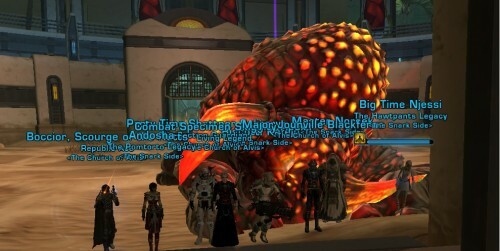 There will be plenty of time to dissect yesterday’s news, but I wanted to take a moment to extend the appreciate of our guild to everyone who has made this game possible. Your hours of hard work keep us entertained and energized. 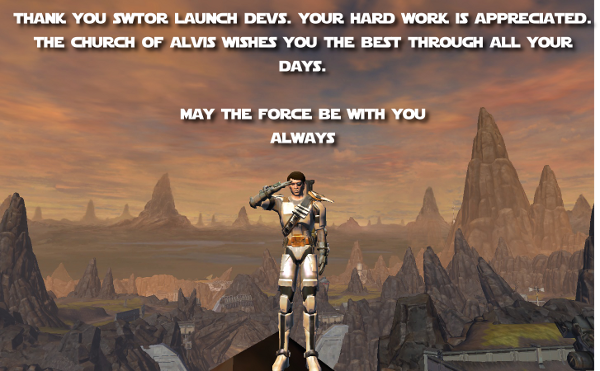 For those who’ve been let go by Bioware, know you are in our thoughts and we hope you have many bright days ahead. One of the most compelling draws to the Star Wars Saga, and by extension the many novels and games made because of it, is the way the Universe has so many small touches. For pretty much any character you’ve seen in the movies, books, comics, or video games, their life has been flushed out and documented at Wookieepedia. One of the challenges that the Bioware team has had since announcing the title, has been finding ways to breath life into their extension of the Star Wars Galaxy by using a similar sense of depth in their game worlds. This post is a tip of my hat to probably an oft overlooked aspect of that process, the music and social scenery. Artwork originally appeared here. Honestly of all Fan Arts I wish this was a real product. The thing these two bands did besides provide us with amazing ear candy, was help establish that there were many stories beyond Luke, Leia and Han going on in the galaxy we all love. It provided a cool Jazz like vibe to the contemporary arts of the universe. That in and of it self in a subtle way built a depth to the universe. 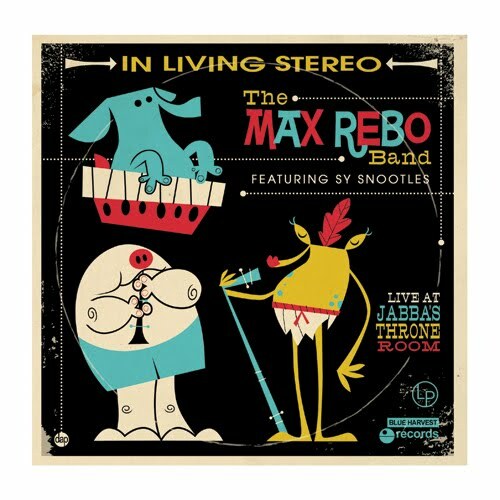 Everyone had their own gigs to worry about and Luke’s problems weren’t necessarily Max Rebo’s. Whatever planet you go to, there is a cantina. Some are big and fancy like my favorite The Dealer’s Den on Coruscant, or small and intimate like the on on Ilum. But in many of them you see live performers. But the visual isn’t the only trick they are using. They also have put a lot of effort to make those jukeboxes littered through out the galaxy play songs that evoke the sounds from the Original Trilogy. For example the sound of “Run Kessel Run” from SWTOR is an awful lot like the original Cantina Song we see in a New Hope. And “Do The Holos Show Up on the Bill” reminds me a lot of Jedi Rocks performed by Max Rebo’s Band. 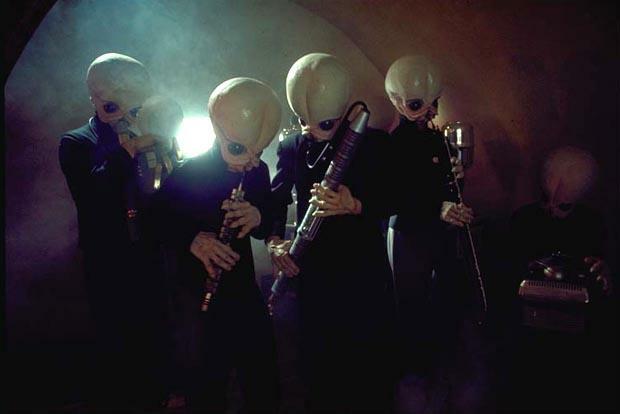 So next time you are strolling through a Cantina take a stop and listen to the sounds around you and appreciate the hard work that goes into making the world be more than pixels and DPS formulas. And if Bioware is looking for additional social items for players, let my smuggler pick up a Kloo Horn, Slitherhorn, or a Fanfar to jam out with at the Cantina. Every smuggler needs a back up plan for retirement after all.